WHO HOO! Strap yourself in, insert quarter, and enjoy the ride! Somehow, while I was constantly hearing nothing but great things about this book, I managed to stay oblivious to the story-line. So I was completely blind-sided to the fact that this book was, essentially, the ultimate gamer’s quest. In a nutshell: An on-line programming mogul James Halliday (a mash-up of Steve Jobs, Bill Gates, and Gary Gygax) created a massive on-line universe called OASIS. When Halliday dies, he leaves his fortune (a number so large that it’s hard to comprehend) to the first player who can uncover the ‘easter egg’ which is done by finding and solving three clues. For many years there was no progress in this task. An entirely new generation grows up spending their entire lives with the focus of understanding James Halliday with the hope of uncovering the easter egg. And of course there are those in power who see the Halliday fortune as a way to stay in power forever and who will stop at nothing to be the first to find the prize. This is a wild tale that is not unlike an inter-active video game. It’s fast and there is danger around every corner, but we keep going for the promise of a reward at the end. This book seems tailor-made for readers of my generation (and slightly younger). Because the game designer James Halliday was a prodigy of the 1980’s nearly all the pop culture references that the future gamers study are all from the 1980’s. From movies, to music, to early video games, this is a delirious trip down memory lane for some of us. But at the same time, I wonder who my own children would react to this book. My boys are readers and watchers of science fiction and have grown up in a culture of Xbox and Playstations, but I suspect that the 80’s references are so many that it will have the opposite effect on some … it will slow it down as they wonder what is being referred to. But for those of us who are ‘in’ on the references, these are our own easter eggs. Catching a Blade Runner reference, or hearing the voice of Max Headroom, is something that only those of us who have also geeked out in the 1980’s will really understand. And no matter how many times I’ve made my boys watch Blade Runner with me, it won’t be the same for them. I loved this ride and this trip down memory lane. I bought a copy of the book at a local bookstore, borrowed an e-copy from my library, and I also had the Audible version, as narrated by Wil Wheaton, on my phone. Early on I would listen to the Audible version while on my commute, but then would read from one of the books where I left off, while at home. But Wheaton’s narration is fabulous. As a geek himself, he gets this book. He understands the references and really does the book justice with his reading and interpretations. For the last two hours of the book, I was glued to the Audible version, even while working about my house. Wheaton’s narration was so easy to listen to. This is a great book for those familiar with the 1980’s pop culture, and there’s a strong enough plot, adventure, and interesting characters that it should be enjoyable to anyone interested in a pop-culture adventure book. I highly recommend this book and encourage anyone interested to listen to Wil Wheaton’s reading of the book. Looking for a good book? Ready Player One, by Ernest Cline, is a fast-paced sci-fi/fantasy adventure that will take you on a thrill ride and it’s one not to miss. 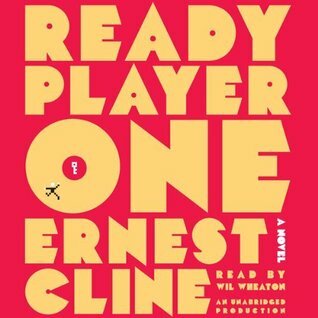 Wil Wheaton narrates the Audible version and adds an extra element of excitement and energy to the book.